Creating waypoints is an important component of working as a Marine Mammal Observer (MMO) in New Zealand. This is done most commonly with a handheld GPS. Prior to using a GPS in New Zealand set the clock to 24 hour, the time zone to Auckland, and daylight savings time to auto. 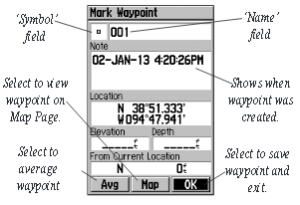 The following instructions are based on a Garmin mapping handheld GPS (GPS 60). To create a waypoint, push MARK and then ENTR, both indicated by green arrows in the picture to the left. Make a note of the waypoint number, but remain focused on the sighting, and spend as little time as possible fiddling with the GPS. The waypoint name needs to correspond with the detection ID (a three digit number 001), which is specified in the MMO reporting forms. Other identifiers are then added to indicate whether or not the sighting is of a New Zealand fur seal, off survey, or a projected waypoint. Detection IDs and waypoints for most marine mammals are numbers (001, 002, 003), the only exception is NZ fur seals, which have the prefix ‘S’ (e.g. S001, S002). Sightings outside the operational area have the prefix ‘T’ (e.g. T001 or TS001). With the exception of New Zealand fur seals, multiple waypoints are taken during a sighting. Each waypoint is labelled with a letter (e.g. the second waypoint of the first marine mammal sighting in the operational area would be 001b, the waypoint of the third New Zealand fur seal sighting outside the operational area would be TS003a). Projected waypoints have a p at the end. To change the name on the mark waypoint page, use the rocker key to select the name field. To create a projected waypoint select the waypoint from the map screen, or push the Find key followed by select Waypoints. Push ENTR. Once the waypoint is selected, push the Menu key, then select Project waypoint from the list. Change the name to the appropriate alphanumeric code, and input bearing and distance by moving the cursor to the desired field, and pushing ENTR. Select the numbers using the rocker key. The units for distance can be changed (e.g. metres or kilometres). Push the Quit key to finish.